View The Canyon Bay I floor plan for a 2108 Sq Ft Palm Harbor Manufactured Home in Houston, Texas. 4 Bedrooms, 2 Baths, 2,108 Sq. Ft. The Canyon Bay has an modern open living concept with great flow for every day living and for entertaining - the Canyon Bay I Model FT32684A - 4 Bedrooms, 2 Baths, 2,108 Sq. 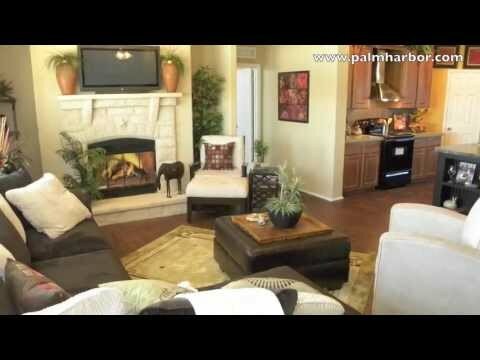 Ft. manufactured home by Palm Harbor Homes. Are you tired of carpet in the common areas of the house? Are you looking for something that is easy to maintain but still gives you that luxurious look? We have added a new Luxury Vinyl Tile to this home that will save your serious $$$! CHECK OT THIS HUGE AWARD WINNING KITCHEN!!! Massive 9ft flat island, deep walk in pantry, 36'' cabinets, and much, much, more!! A walk-in pantry is something every lady of the house needs. Notice wood rods and shelving in the pantry. Again another small thing we do that we don't have to. Most builders will try and save money in these areas. Utility Rm Bench makes life a little easier for you and the kids..come in from school and take off shoes, put backpacks on the hooks, and books at the top so they are not scattered all over the house! Other built-ins for handy storage. Storage, double sinks, big tub, sitting bench, water closet- this Canyon Bay has everything! WE HAVE DONE IT AGAIN! This walk-in closet in the Canyon Bay I is large enough for both of your clothes AND for y'all to be in at the same time! This alternative, 6/12 roof pitch is a nice addition as well! Don't wait any longer...hurry in and see this home in person! Ask about our most recent promotions! Introducing the only Canyon Bay of its kind. This home features an optional residential 6/12 roof pitch & covered porch. 4 Bedrooms, 2 Baths, 2108 Sq. Ft.